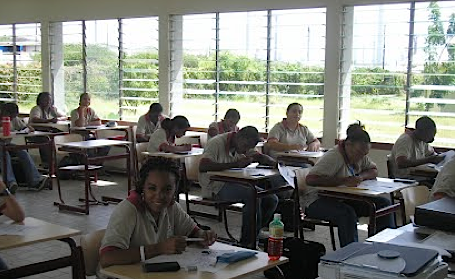 WILLEMSTAD - The nuisance at schools caused by the oil refinery Isla will be addressed. That is what the Minister of Education says. Four schools are in danger zone: Juan Pablo Duarte School, Kolegio Nechi Pieters, Princess Margriet School and Cola Debrot School. To close these schools temporarily is one of the options for the Juan Pablo Duarte School, which also has the most problems with pollution. Due to the lack of wind these days, there is more nuisance than usual. The Minister and her ministry will make a decision on this issue soon. Photo: Juan Pablo Duarte School with the refinery in the background.